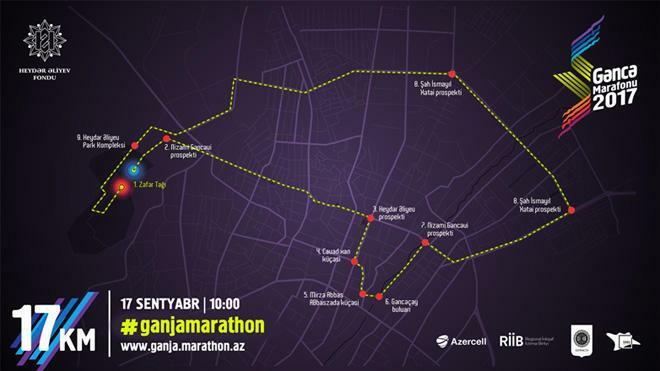 Ganja Marathon-2017, organized at the initiative of the Heydar Aliyev Foundation, will kick off today. Marathon will cover a distance of 17 kilometers, starting at the Triumphal arch and finishing in the Park Complex named after Heydar Aliyev. The objective of Ganja Marathon-2017 is to create a new culture in the sports history of Azerbaijan. Main goals of the event include assistance in the development of sports industry and the encouragement of young people for healthier and more balanced lifestyle. Individuals and corporate participants will not make any payments, as the necessary funds are met by the Heydar Aliyev Foundation. The awards ceremony of the Ganja Marathon-2017 will take place in two categories. Both male and female participants of the marathon will compete for the first three places. Organizers will award the following prizes, as well as gifts and medals and certificates in male and female categories.